A move in to a new home can be stressful, but can also be exciting, at Gibraltar, we feel moving in to any new home should be a continuation of one’s life, we believe life shouldn’t change just because your new home is a care home. Fiona Mirylees, one of our family members, moved in to Gibraltar Nursing Home in February. During the course of her first few weeks, the team focused on finding out Fiona’s likes, dislikes, favourite pastime hobbies, previous occupations and holiday destinations. If Fiona went on holiday prior to moving in to the home and she was able to travel, why not carry on with the same tradition? One of the team members had seen an advertisement placed by Willets of Coleford, a travel company, who had partnered with the Queens Hotel in Paignton offering a 5-day “Turkey and Tinsel” break. Fiona showed an interest as well as some of her neighbours who live within the grounds in the Independent Living Village. So, plans were put in to action and Phil Hannant, Village and Home Liaison, along with 2 care team members supported 14 people, all from the home and Independent Living Village travelled down to Paignton for a fun pre-Christmas break. The 5 days included a mock Christmas Eve with festive food and entertainment, then on the Tuesday, the group visited the beautiful Buckfast Abbey and later devoured a traditional Christmas dinner with all the trimmings and complimentary wine. 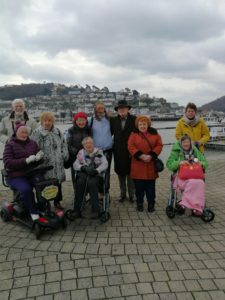 Instead of taking ‘Boxing Day’ to relax, the group hired wheelchairs for those that needed support and went for a leisurely stroll along the sea front, taking time to embrace and appreciate the cool sea air and picturesque views.